While trying to fly to Memphis today I began paging through my photo stream and came upon this picture. 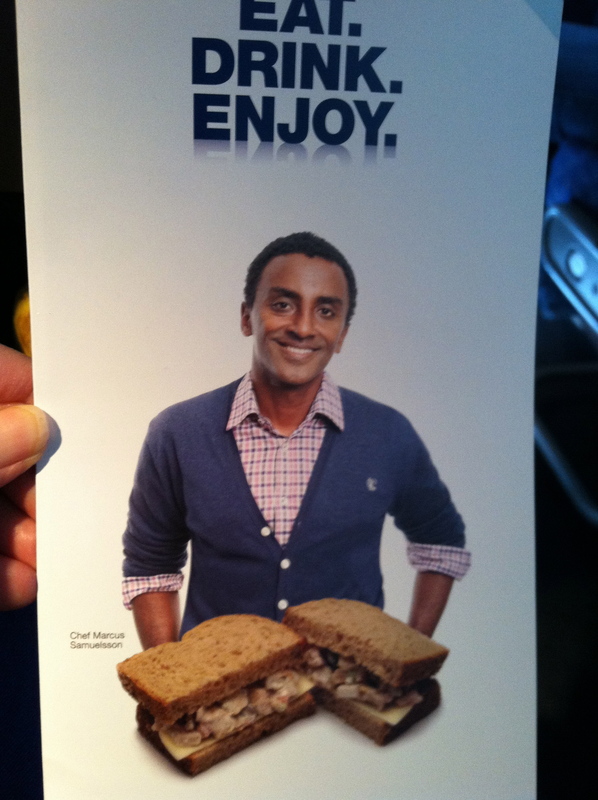 It was the front page of the in-flight snacks menu that American Airlines was giving out just a month ago, mere moments before they merged with US Air. I took a picture of it with my phone, it looked so strange to me. I suppose they’ve destroyed all copies of the thing by now, bearing as it did the ‘old’ AA logo and a good thing too. It looks like the man has two sandwich halves for legs. What’s the guy silently saying anyway? “Try running on these babies, Mr. Pistorius!”? Speaking of ads, don’t you love the little gecko for Geico? He is so adorable – I wish they would market him as a stuffed animal. It has been said that his accent is Cockney, but I thought it was Australian. Anyway, I have a crush on the little guy. Joan, I love that little guy, too, especially the commercial where he gets the giggles. Terry, did you ever make it to Memphis?